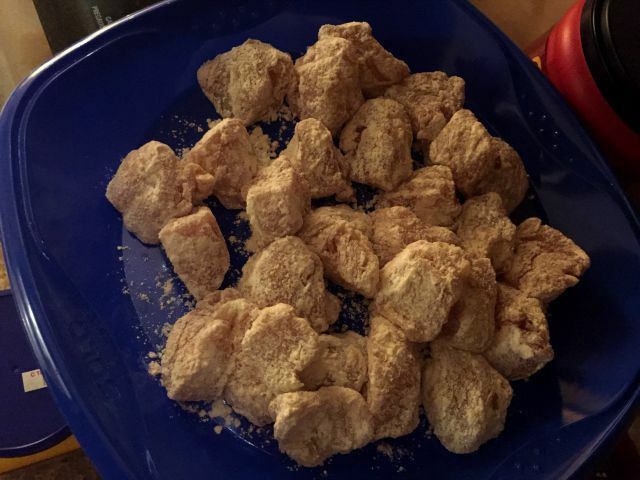 This recipe might be the most infamous family dish in the history of Przybyla family cooking. My Dad (Chef Ken) was invited to compete in the National Buffalo Wing Fest for the best amateur wing sauce for five years in a row, starting with the inaugural festival in 2002. This was our family’s first real experience with live cooking (a la “Chopped” style) and really turned us on to the foodie world. My sister Kristin acted as Dad’s Sous Chef on stage (at an impressive nine years old) and together they were a force to be reckoned with. He was even asked to contribute to Food Network and made a couple television appearances in the process. A favorite among the local fans (and of course, our family), here is the edited version that you can whip up as a meal at home. To start, we’ll cook the chicken. 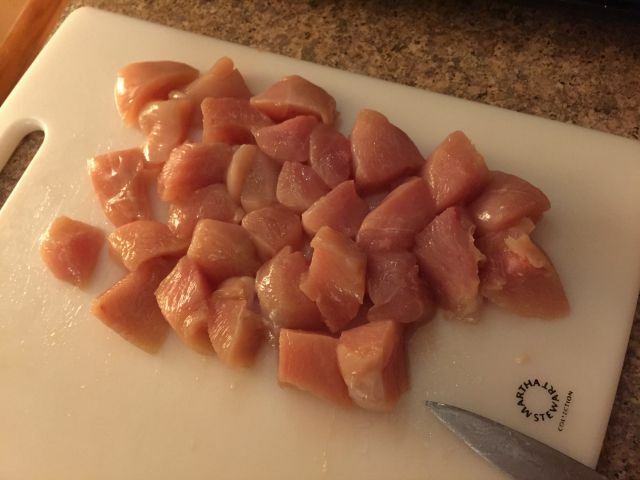 Sometimes working with raw meats can be intimidating, but here’s a step by step look at how we worked with the chicken. 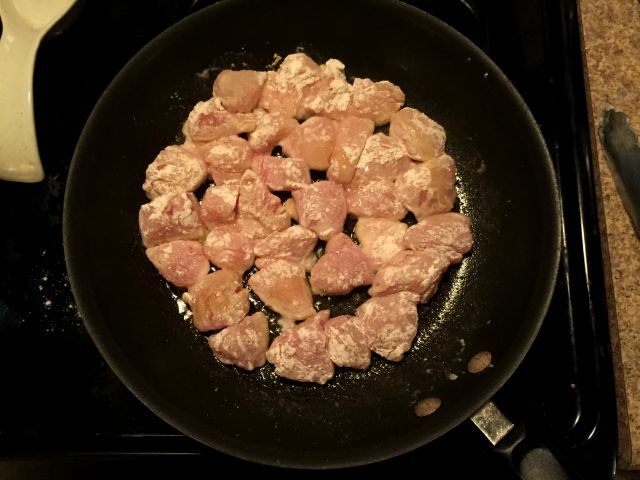 Cut the chicken breasts into equal sized pieces and season with salt. 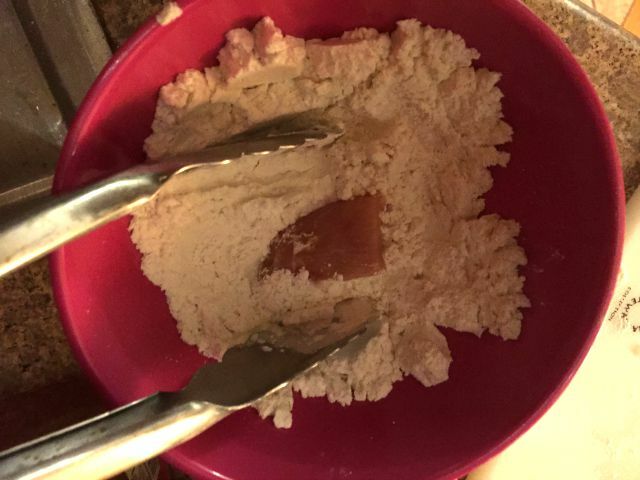 You’ll then want to fill a small bowl with the all-purpose flour with just enough to toss the pieces in to coat the outside. Set aside until all are finished. Once coated, heat a sauce pan with vegetable or olive oil to cook the chicken pieces. 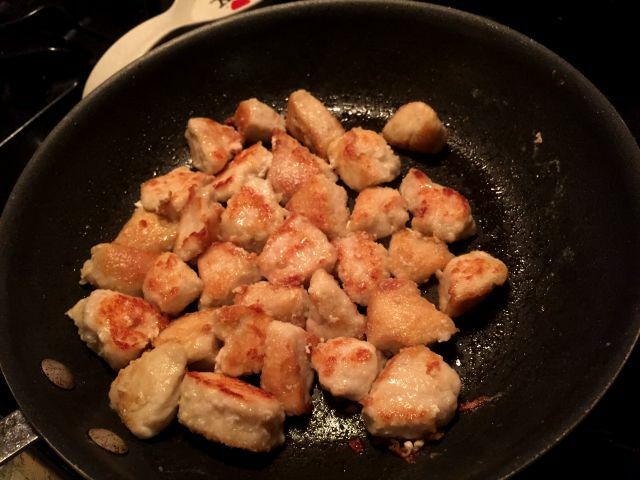 Flip the chicken pieces over once they are cooked through over 75% of the way on the first side. You’ll want them to be golden brown and slightly crispy like in the photo below. It’s very important too, working with raw chicken to thoroughly clean and wash all kitchen utensils that were used to prep. We highly suggest using a separate set of tools, but if you cannot, make sure to give a really good scrub to everything intermediately after use. For now we’ll set aside the chicken and work on the sauce. The color will differ depending on how much hot sauce you add (if you like things with more of a kick, feel free to add more). To begin, grab a separate mixing bowl. Combine the 3 teaspoons of corn starch, 1/2 cup water, 1/3 cup lemon juice, 3 tablespoons of hot sauce and 2 teaspoons of soy sauce. Slowly mix, as the corn starch will act as our thickening agent. 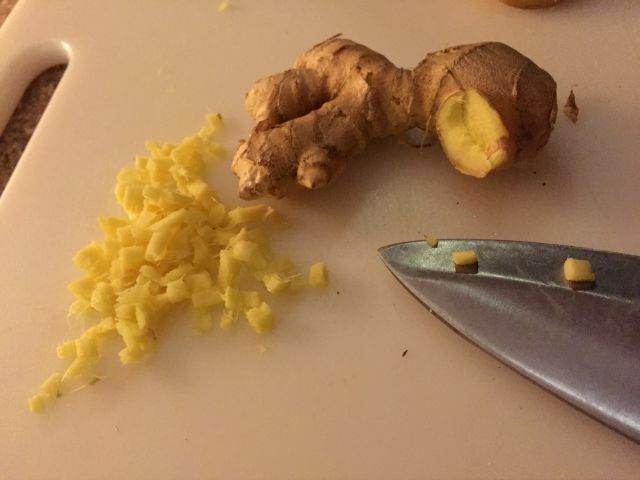 Finely chop up your piece of fresh ginger (seen above) and garlic cloves. Now go back to the empty sauce pan (since you set aside the chicken). 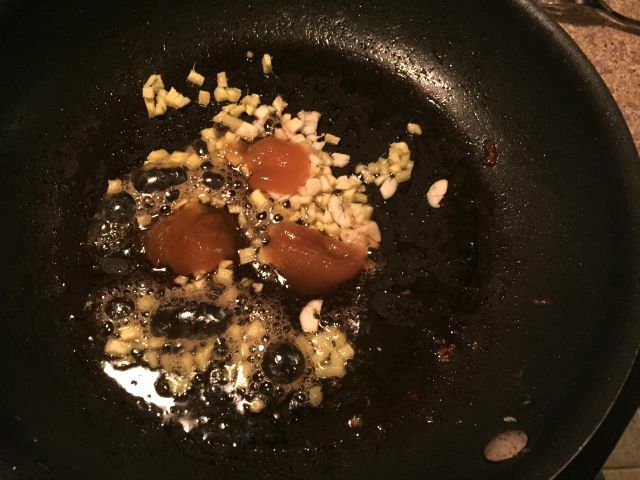 Put in 1 tablespoon of vegetable or olive oil and heat, toss in the finely chopped ginger and garlic cloves. Add the honey as well and cook together for about a minute, mixing as you go. Next we’ll add the first mixture we put together in the separate mixing bowl. This is where the glazed magic happens. Give the mixing bowl, a few stirs to make sure the corn starch hasn’t settled. 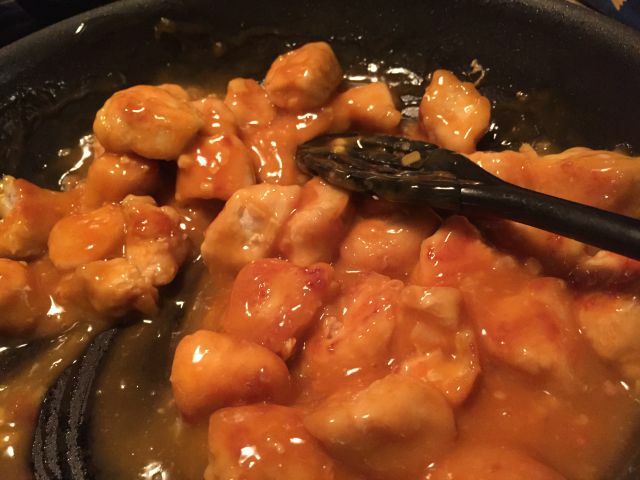 Pour the mixture into the saucepan, over low-medium heat and continuously stir, the sauce should turn from a milky-red to a glaze (think General Tso’s consistency). 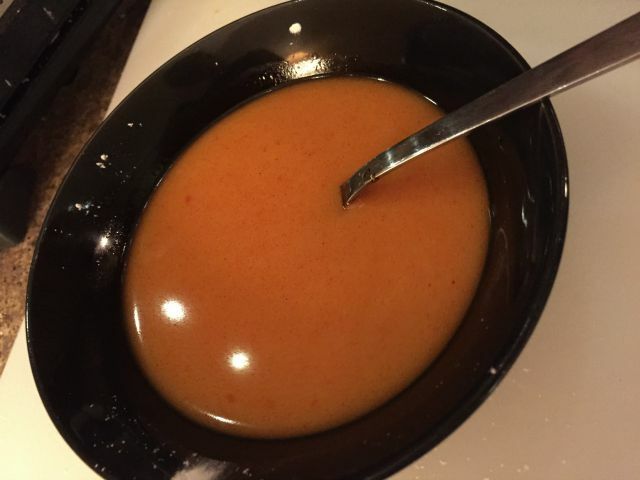 If your sauce is too thin, add a touch of cornstarch to thicken. If it’s too think, add some water or lemon juice to thin. 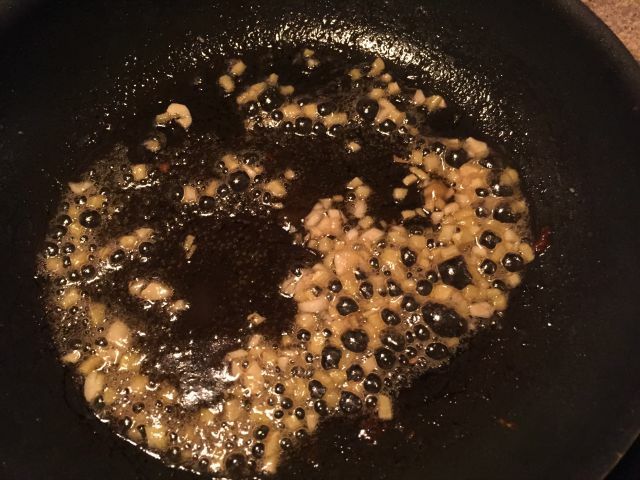 Once mixed thoroughly, add the cooked chicken and turn off the stove. 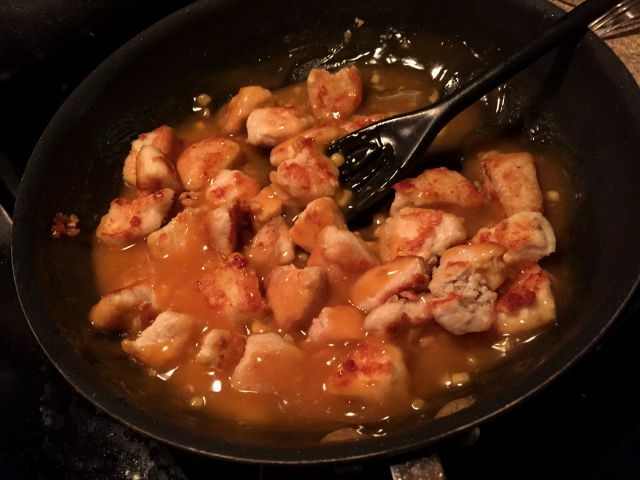 Toss the chicken in your honey chili sauce and make sure all piece are coated evenly. Once combined, taste the sauce and adjust to your liking. If you prefer a little spicier, add some crushed red pepper flakes and/or some more hot sauce and mix. For a little more citrus, add a bit more lemon juice. To serve, toss over a plate of rice (steamed jasmine rice works best, but I was all out and needed to substitute orzo in it’s place). 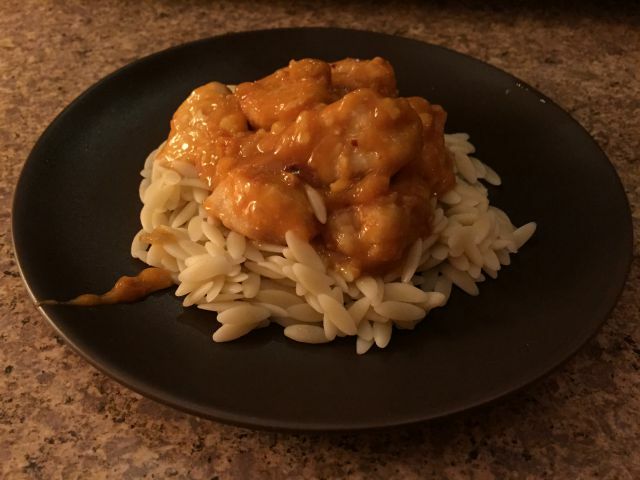 Enjoy this family dish of ours! The leftovers are even tastier. Tags: Buffalo, Chef Ken, CHICKEN, chicken wings, dinner, Frank's Red Hot, garlic, Ginger, Glaze, Honey Chili Chicken, lemon, rice, ROOKIE CHEF. Bookmark the permalink.